a median return on investment of 14:1 is possible if you take action on throwing away less food. 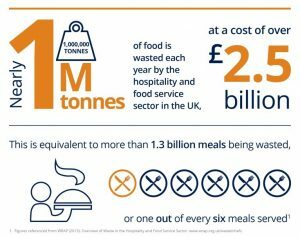 Not for profit sustainability body WRAP found that nearly one million tonnes of food is thrown away by the hospitality and food service (HaFS) sector each year in the UK. An astonishing 75% of this food could have been eaten, which is equivalent to one in six meals being wasted. And 18% of the food purchased by the sector ends up being thrown away. 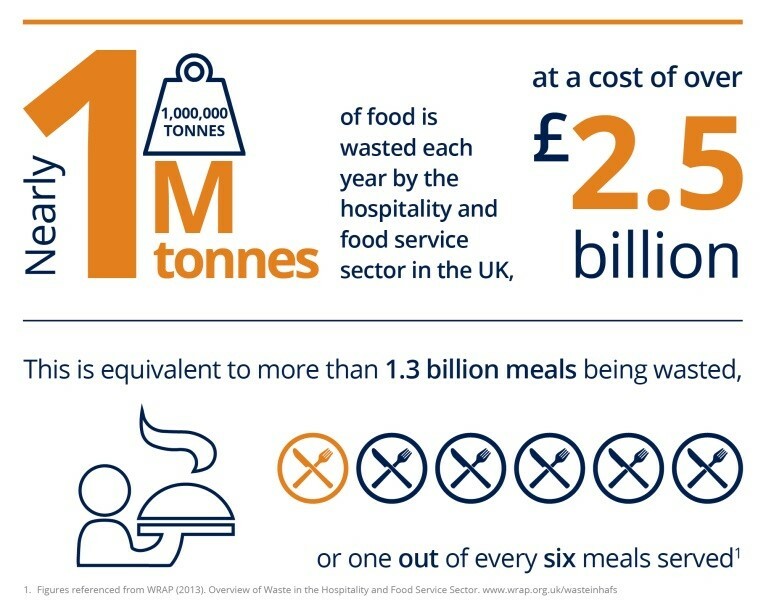 For UK hotels, the cost of food waste is the equivalent of $0.68 per meal. So any food waste prevention goes straight to the bottom line of the business. WRAP worked with UK Hospitality and Food Service businesses through a voluntary agreement approach over three years and achieved savings with the sector of 11%. Over the lifetime of the HaFSA, the estimated weight of food waste avoided by the signatories was 24,000 tonnes with a value of $88 million, this is equivalent to 48 million meals. Food waste recycling went from 25% to 40% over the three years of the Agreement. Redistribution of surplus food doubled to 1.5 million meals. WRAP’s work on reducing food waste in the HaFS sector is now being delivered as part of the Courtauld Commitment 2025; an ambitious voluntary agreement that brings together organisations from across the food system – all the way from producer to consumer – to make food and drink production and consumption more sustainable. WRAP is now working with the sector on the ‘Your Business is Food, don’t throw it away’ campaign to help businesses by providing them with simple tools and proven techniques to track the amount of food that is going in the bin. Simple processes that can be built into everyday practice by sites.